We know that Microgaming have a strong track record in designing compelling online slots but how do they fare when they turn their hand to table games. In this article we’re going to check out Premier Roulette, a good-looking version of this classic casino game available to play at our recommended online casinos. The first thing to say is that Premier Roulette is a European version of the game which means there is just one zero segment rather than two in the American version. This clearly provides a slightly improved RTP for the player. 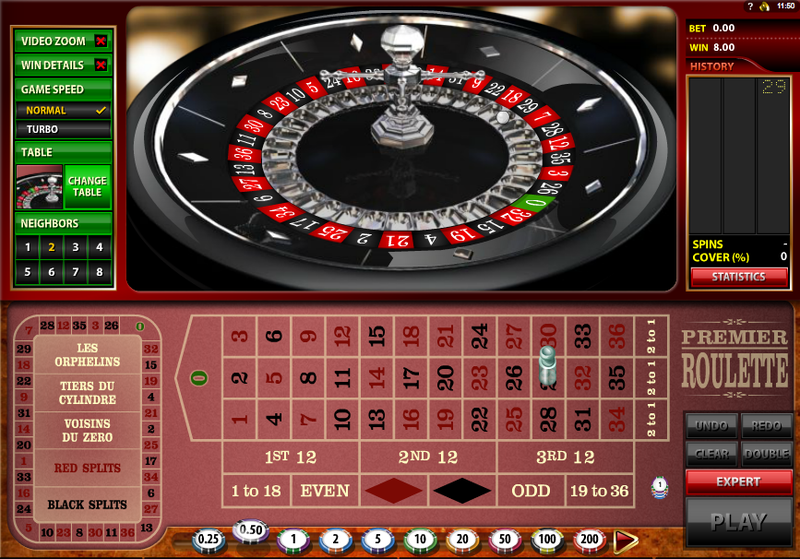 Load up the game and you’re faced with plenty of information on the screen – the roulette wheel takes centre stage at the top above the betting table which also includes the betting racetrack to the left. The box in the top left hand corner offers options such as game speed and colour while on the right you can view your game history. Betting options are in the bottom right hand corner. For the simpler bets all you need to do is select your chip size and then place it in the required position on the table. Betting options range from £0.25 – £10000. If you’d like a more complex bet then check out the racetrack on the left of the table; here you place bets which relate to neighbouring positions on the wheel. For example the Voisins Du Zero is a bet on 16 numbers surround the zero segment. Black and red splits is a bet on two red/black numbers occurring together on the betting table. For some even more complex bets, click the small ‘Expert’ button at the very bottom of the screen and a red button labelled ‘Call bets’ will appear on the right hand side. Here you will find some oddities like ‘Snake’ which bets on a winding row of numbers on the table or ‘007’ which includes numbers in the shape of ‘007’ on the betting table. Read more about roulette betting by clicking here. Once your bets have been placed, just press ‘Play’ and watch the ball settle into it’s segment, hopefully winning you some money. Premier Roulette offers some extra betting options which other versions do not have and that’s a welcome addition. On the downside it’s perhaps not quite as smooth as other variants we’ve played.